Sharon Greene was one of those choir girls in high school. She didn’t mean to bother you. She just liked to sing madrigals. She was also in Show Choir. Her Principal work in their all-white Porgy and Bess Medley is remembered fondly in South-Eastern Michigan to this day. She attended Northwestern University, receiving her degree in Show Choir. 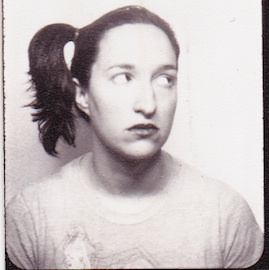 Sharon joined the Neo-Futurists in 2003. In addition to writing and performing in TMLMTBGB, she has performed in A 60 Minute History of Humankind, served as a writer-performer for Inside My Mouth, and was the creator of Windmilled: Tilting at Don Quixote which was remounted at the 2005 PAC/Edge Performance Festival. Sharon was proud to be a Teaching Artist with About Face Youth Theater in 2005. Her work has also been included in Serendipity Theaters’ Second Story Series. She currently resides in Los Angeles with her wife, Logan, where the two of them are preparing to embark on a career as a feature film-making power couple.